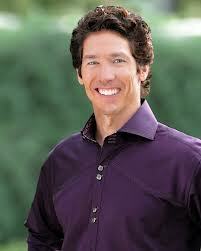 An April Fool’s hoax last month involving Joel Osteen received a great deal of media attention. A Minnesota man spent $12 and five hours to register a domain name on April 1 that closely resembled the real website for Joel Osteen Ministries, http://www.joelostenministries.com (note the single “e”). He designed the fake website to closely resemble the original and posted a “Special Announcement: I am leaving the Christian faith” along with a photo of Osteen. The post continued: “many of my sermons have deviated from traditional Christian doctrine. I have been accused of altering the ‘message’ to fit my own doctrine and dogma. Others have accused me of preaching ‘feel good Christianity’. I have also been accused of profiting greatly from my ministry, with my books and television deals. Many of [these] criticisms are legitimate.” It went on to state, in a gasp-inducing reveal, that Osteen had been questioning his faith for years, no longer believed that the Bible was true or that Jesus Christ was the son of God, and stated that he believed the “God of the Bible” was a “fictional character,” like Osteen himself. The announcement was backed up by a YouTube video that featured screenshots of the website and doctored CNN and Drudge Report headlines appearing to confirm the news, played over ominous-sounding music; a fake “Christianity News Texas” blog post on April 2 that reported on the “Special Announcement”; and a corresponding fake Twitter account @PastorJoelOsten. The “Special Announcement” quickly received over a million page views and was reported on (if sometimes hesitatingly, as “unconfirmed”) by NPR, ABC News, the Huffington Post, New York Daily News, the Houston Chronicle, and many other local news outlets and blogs. 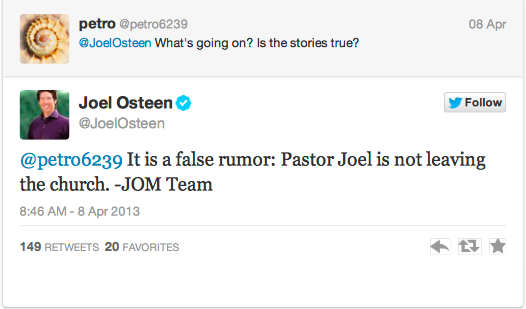 The earliest official denial came from the real Joel Osteen’s Twitter account on April 8 in response to a tweet: “It is a false rumor. Pastor Joel is not leaving the church. – JOM Team,” it read. The media coverage then shifted to reporting on the hoax: “Pastor Joel Osteen Is the Target of a Complex Online Hoax,” read the earliest national news headline, NPR’s on April 8. This was followed by several other national and local reports. Second, authenticity online is often self-referential, and its sources self-authenticating. Bolter and Grusin’s influential study of “remediation” makes the point that media sources are constantly interacting with one another in a web of self-justifying logic, particularly new media. It was the combination of the fake website, Twitter account, YouTube video, and blog, and the real news outlets that then picked the story up as newsworthy and continued to spread it, in other words the self-justifying logical circularity of “news” and an (at least initial) inability for users to distinguish between credible news outlets and non-credible ones, that contributed to the plausibility of the announcement.